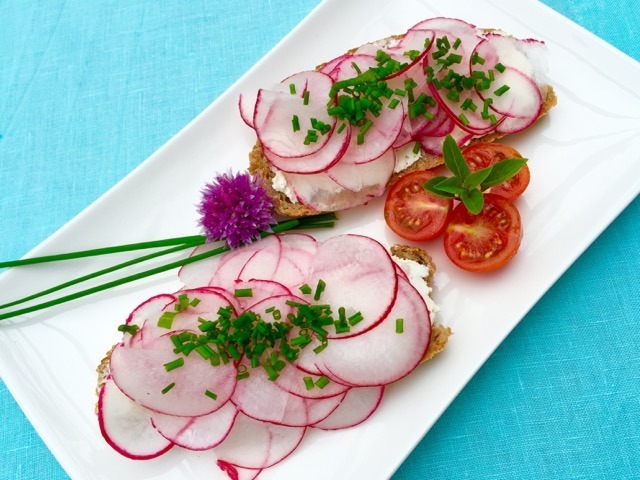 One year when we had grown more radishes than we could eat, a friend from Switzerland suggested radish and cream cheese sandwiches. It seemed strange, but we thought we’d give it a try. And, guess what? We were pleasantly surprised by this unusual combination, and now look forward to a plethora of radishes every spring and fall! And thanks to the same friend for sending us photos to use. Isn’t this beautiful? You will not be disappointed by this simple, yet unusual combination. The crisp texture and spicy flavor contrast beautifully with cream cheese. Use regular or Neufchâtel, which is a lower-fat cream cheese. We serve this as 2 open face sandwiches, or cut into smaller pieces as appetizers. Set cream cheese and butter out on counter for about 15 minutes to soften enough to spread easily. Lay 2 thin slices of bread on a flat surface. Spread about 1/2 teaspoon of butter evenly on the bread, then spread 1 tablespoon cream cheese over each piece. 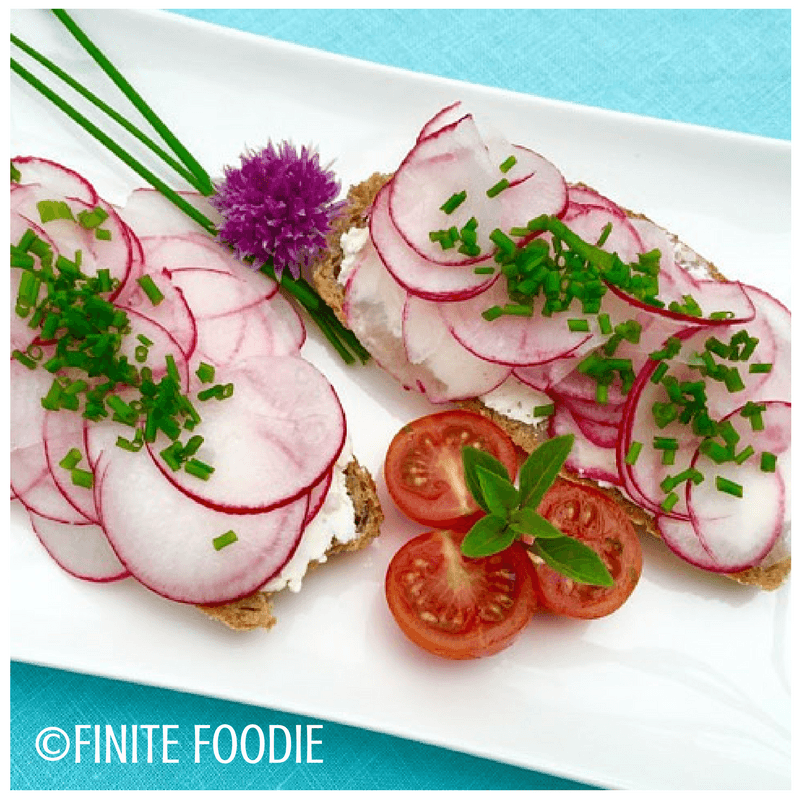 Thinly slice the radishes and scatter over the cream cheese. Sprinkle a pinch of nice, coarse salt (if available) over the radishes. Slice a teaspoon or so of chives and sprinkle on top. Garnish plate with longer pieces of chives and a chive blossom, if desired. These also work as appetizers. Cut bread into 2-inch x 2-inch squares, or buy bread that comes in the size. Make as many as you want! 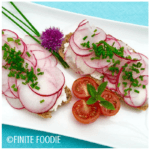 Chop radishes and mix into cream cheese.